I'm making an honest effort not to just post videos and incoming recruiting posts around here. But with the recent influx of verbal commitments and good video content, it's been tough. However, there is football going on and therefore, we must discuss it. There's no question that the rumor mill is alive and well coming out of Fort Schembechler right now with spring ball in full-swing. We're hearing a lot of interesting tidbits, so let's dive right in. First, the offense. There seems to be little change in how Denard will be handled in the Al Borges offense - year two. 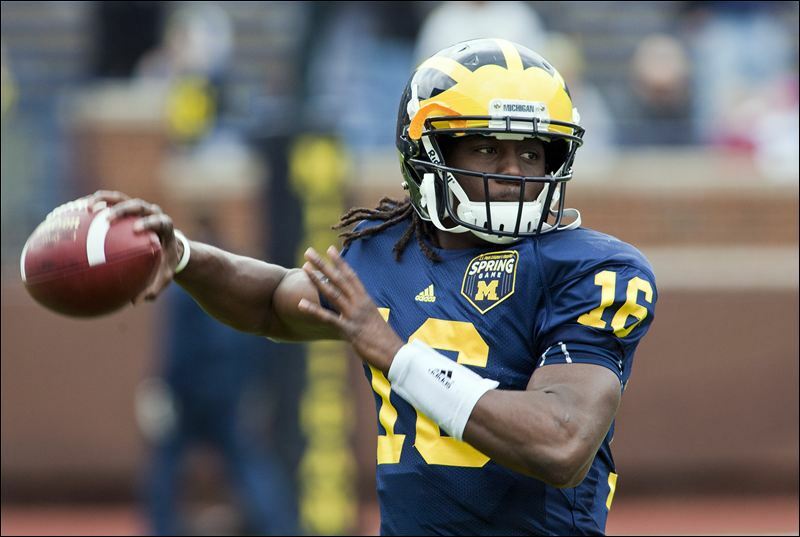 Denard is Denard, and no one seems to want to change anything about how he plays the QB position. There's no doubt he'll spend his senior season doing what he does best. If he's getting looks at WR, they must be doing a good job keeping it a secret, because we're not hearing anything. Devin Gardner is splitting time at practice between taking snaps at the backup QB spot, and also at WR. Word on the street is that he's looking as good as anyone they have catching the ball right now. I can't say he's going to be seeing any extended time in games at the receiver spot, but it seems as if the coaches want to at least explore this option in the spring and he how he looks. It will be really interesting to see how much they show us at the spring game. Third-string QB Russell Bellomy has been looking solid. He must be, otherwise the coaches would not be so willing to test Gardner at WR. To be so haphazard with your backup QB is foolish unless you have a decent and competent third-stringer. And from what we're hearing, Bellomy is just that. The areas of concern, center and left guard, are looking a little clearer. Ricky Barnum is said to be looking good at center. His snaps are good and clean. But as we all know from watching Molk the last two seasons, the center does much more than just snap the ball. It will be interesting to see how Barnum is able to lead the OL. Also getting a look at center is Jack Miller. Holding down the other question mark on the OL is senior Elliot Mealer at the left guard spot. Behind him...walk-on Graham Glasgow! Word is he's solid. At right guard is Patrick Omameh, no surprise there. And the tackles are on lock down with Lewan and Schofield at left and right, respectively. All that said, I still think incoming freshman Kyle Kalis competes for a starting gig somehow. Probably at a guard spot. Maybe not for the opener, but at some point. Fitz is the obvious favorite right now at RB as the returning starter. Backing him up, however, it's a little less obvious. There's no doubt Vincent Smith is still very much in the mix, but his size is a huge limitation. The coaches have made it clear that they need/want bruisers at RB. Smith will be relegated to a third down option, or maybe a slot in some four or five-wide looks. Smith can catch and run with the ball, so he's dangerous in that regard. Red-shirt freshman Justice Hayes has been said to have gotten bigger, and he's getting some looks this spring. As is Thomas Rawls at FB. There's also some hype for incoming freshman Dennis Norfleet, but he doesn't enroll until the fall. Roundtree is moving to flanker, as we all know. He and Gallon will be vital to the success of this offense in 2012. Getting some attention this spring is sophomore Jerald Robinson, who has had some nice catches in scrimmages. I also like what Dileo adds to this offense, but guys his size are not what what we really need. It seems as if this position is maybe the biggest area of concern on offense. Is Gardner the answer? Can incoming freshman Amara Darboh compete? There's a lot we just don't know right now. Another trouble spot for the offense, no question. Senior Brandon Moore has been said to be doing well, but he's got a ways to go. Ricardo Miller is also in the mix, but is said to be struggling a bit. Moore is a better blocker than catcher, and Miller is struggling getting used to having his hand down. I think a freshman is going to have to step up and make a splash. We'll see what newcomer Devin Fuchess can do when he steps on campus this summer. We'll post some defensive rumors shortly. - Why is Chris Bryant's name never mentioned at Guard? He was exactly what the coaches were hoping for and even though he's a RSFr he should still be getting a mention if he were going to pan out I'd think. - You mentioned Rawls at FB, not RB. Is that by design? I'm a little concerned that these big bruising RB that are also supposed to be the poster children for Hoke's offense keep getting moved to FB. - Lastly, Miller at TE. I really want things to work out for that kid. He moved to Michigan as a senior to prepare for college better, he started out highly ranked and then fell off for a variety of reasons, and now we have a lack of big outside WR and he's scuffling at undersized TE because he can't block well enough. First off, the back up LG is not walk-on Graham Glasgow, it is Chris Bryant. Yes, Glasgow is getting snaps with the second team, but that is because Michigan's depth is very thin at both the offensive and defensive line. Both head coach Brady Hoke and OC Al Borges touched on this several times. Glasgow is a big kid 6'6" 315 and is a mauler, the coaching staff wants to see what he can do, especially since they have very little options at guard this spring. None of the 2012 OL recruits enrolled early so that leaves the coaching staff to work with what they got. Once again, Chris Bryant is the primary backup at LG and at RG. Rawls is seeing action at FB because Borges wants to have his best 11 players on the field (packages they excel at). This is why he is getting some snaps at FB. The coaches are high on him as a RB, but they know Toussaint is going to get a bulk of the carries and Vincent Smith is going to be Fitzgerald's primary backup and the 3rd down back. Also, Michigan is thin at FB this spring. The Wolverines only have two true FB one their spring roster and they are both walk-on's Joe Kerridge who the coaches really like and Paul Gyarmati who will never see the field. Stephen Hopkins is listed as the #1 FB on the depth chart, but Rawls is getting a look because of his toughness, blocking ability and his good hands out of the backfield.